We are getting closer to Christmas, so it's time to start thinking of ideal presents, stocking fillers and, of course, great books to warm you up throughout this festive period. Instead of me promoting this new book, I'm delighted to be able to introduce Lora to tell you more about this amazing series. Hi, I'm Lora and Mr Ripley's Enchanted Books has kindly let me take over his blog, so that I can tell you about the story of my family on Mars. It's a story like no other a story - you will need to read it to believe it. 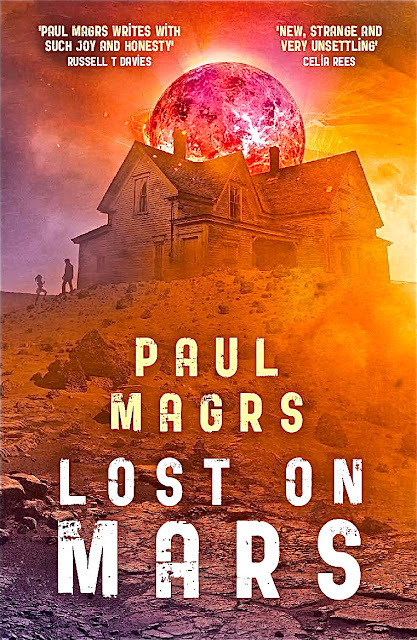 We are lucky enough for Paul Magrs in writing a truthful account and for FireFly Press for publishing our little family tale. 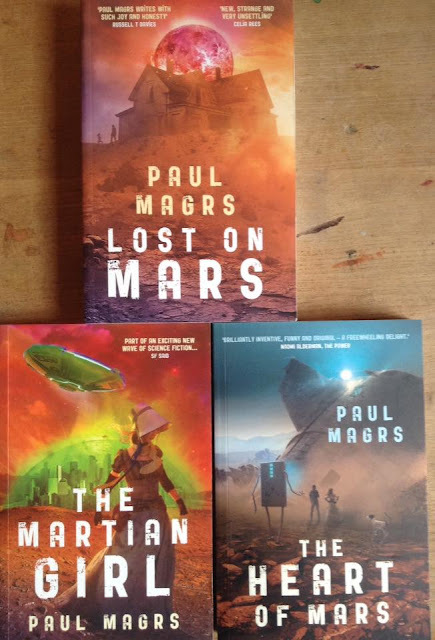 We call it the (The Lora Trilogy) The first in this epic Sci-Fi series Lost on Mars was published in May 2015 and the sequel The Martian Girl was published in September 2016. The last in the trilogy, The Heart of Mars, was published in March 2018. Mr Ripley has been a great supporter of the books and would like to recommend them to you all. This is a great Christmas present for everybody young and old. There’s not many of us left now. Not after the Disappearances and all the terrible things that happened. Life was tough on our Homestead, but we liked living there, out on the red Martian Prairie. There was Mum and Da and our crazy Granny with the mechanical leg and the laser eye. Then there was Toaster, our robot, who did loads of work around our place, and who used to be a sun bed once upon a time. Why did the people of the first landings ever bring a sun bed to Mars? Where the sun’s so blistering all the time? When the heat gets wild and the dust storms come rolling over the plains, destroying our crops and bringing with them the terrifying ghosts of dead Martians. Oh, yes. That’s where my tale begins. This whole epic adventure begins with the time that the storms came in the late autumn and ripped away all our fields of green corn. We were going to go hungry and cold that winter anyway, and that was bad enough. But then folk started getting Disappeared. We lost our Gran. She got whizzed away in the night, leaving just her electronic leg and eye behind. Then our Da went too, and we knew who’d got him. I could hear their laughter when I sat up late at night and my brother and little sister were asleep. And I knew the Martian ghosts were coming for all of us. I kept a journal the whole time. I knew that the day would come when I would have to tell you all about our journey and our adventures. I knew I would tell you eventually about what happened when those few of us from our town were lost on Mars.